If you are looking garage door repair and replacement in Livonia, MI then Elite Garage Door Repair of Livonia can meet your garage door needs. We have a team of experienced, skilled and licensed technicians that can handle any garage door problem large or small. Here are just a few of the garage door problems that we here at Elite Garage Door Repair can solve for you. Your garage door springs serve an important function. The springs of your garage door allow your garage door to raise and lower with ease. Should your Garage Door Springs fail your garage door may come crashing down causing you, your family or pets injury or even death. Proper maintenance of your garage door will help to keep those garage door springs working properly and allow you to spot small problems with those springs before they become a dangerous problem. Garage door springs are either torsion or extension springs, which can become worn or break. Here are some signs that your garage door springs may need to be repaired or replaced. •Is your garage door making a squeaking sound or excessive noise whenever you open or close the door? If your garage door is making noise or has developed a squeak, then there is a good chance that one or more of your garage door springs are worn. If this is the case, then you need to call Elite Garage Door Repair of Livonia to examine your springs and repair or replace them should the need arise. •Difficulty in Opening or Closing Your Garage Door – Another sign that your garage door springs may be worn or broken is if you have difficulty opening or closing your garage door then the chances are good that your garage door springs may need to be repaired or replaced. 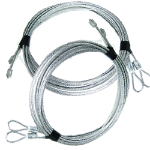 •Lack of Safety Cables on Extension Springs – Safety cables provide a second layer of safety preventing your garage doors from crashing down should a spring break. If this is the case, you need to get safety cables installed as soon as possible. Here at Elite, we can handle your Garage Door Spring Repair or Replacement safely and effectively, so your family remains protected from serious injury. Your Garage Door Opener is not only convenient it provides you and your family with a measure of safety since you don’t have to get out of your car until your safely inside of your garage, and the door is securely closed behind you. However, if your garage door opener malfunctions you may find yourself out in the cold trying to open your garage door manually. Here at Elite Garage Door we can repair your garage door opener or should the need arise even replace it. We can provide you with fast and efficient garage door opener repair and replacement should the need arise. We even offer a garage door parts warranty, so you should get those new parts malfunction it won’t cost you out of your pocket. Whatever your garage door repair or replacement needs we here at Elite Garage Door we can meet those needs for you.